The new A2G-mini differential pressure gauge from WIKA has been specifically designed for small and medium-sized central ventilation and air-conditioning units. With a nominal size of 63 mm and an insertion depth of 32 mm, it can be fitted in the tightest of surroundings. The A2G-mini has been developed with a view to the EU directive for energy-efficient ventilation and air-conditioning systems: From January 1st, 2018, all central units with an air flow of more than 1,000 m³/h must have filter pressure monitoring. 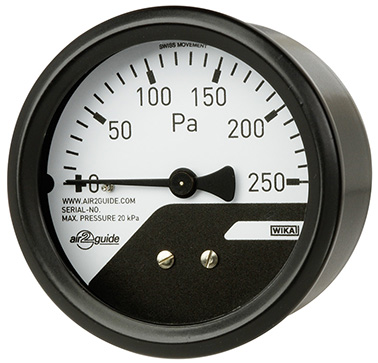 The new differential pressure gauge indicates rising pressure loss reliably and in an easily readable format. It is available with four measuring ranges from 0 … 250 Pa to 0 … 1,000 Pa. The pressure gauge is completely silicone-free and thus fulfils the requirements of ISO 846 (microbial metabolic potential). With IP68 ingress protection and a UV-stabilised window it is also suitable for use in outdoor areas.